Yesterday, the price of "black gold" declined due to growth forecast for oil production in the United States for 2019. The US Department of Energy predicts an increase in shale oil production next year of 0.3 million barrels per day. In the second half of 2019, a loosing of transport restrictions in the Permian basin is planned, which will lead to a significant increase in production and export. In addition, on Wednesday, the instrument was under pressure from the API report, which reflected an increase by 9.75 million barrels a week. After Hurricane Michael, activity in the Gulf of Mexico declined, which kept oil prices from further falling. Experts consider the idle time to be short, and the share of production insignificant, so investors expect the resumption of price decrease before the end of this week. Today at 17:00 (GMT+2) the publication of EIA Crude Oil Stocks change report is expected. The forecasted increase will affect the price negatively in the short term. On the 4-hour chart, the instrument decreases along the lower border of Bollinger bands. Key support is 72.00. The indicator is reversing downwards, and the price range has widened significantly, indicating a continuation of the downward trend. MACD keeps a strong sell signal. 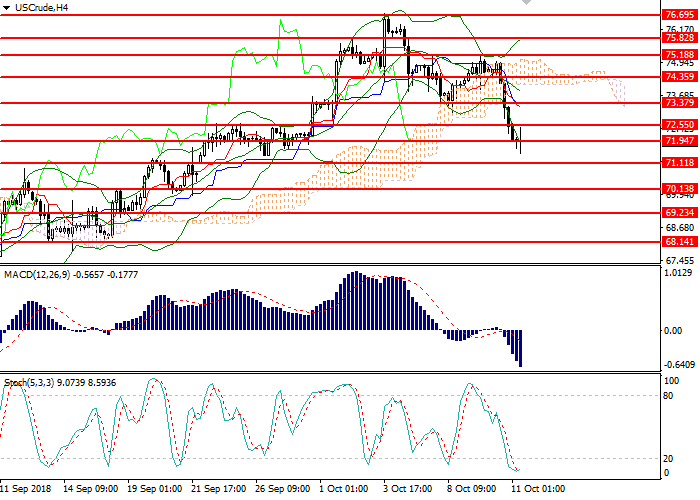 Stochastic entered the oversold area, a buy signal can be formed within 1–2 days. Resistance levels: 72.55, 73.38, 74.35, 75.18, 75.82, 76.70. Support levels: 71.95, 71.11, 70.14, 69.23, 68.14. Short positions can be opened from the current level with the target at 70.13 and stop loss at 72.60. Implementation period: 1–2 days. Long positions can be opened above the level of 73.38 with the target at 74.35 and stop loss 72.90. Implementation period: 2–3 days.